Francis Light was born in the county of Suffolk, England, in 1740. After receiving a grammar school education he joined the Navy when he was nineteen and served as a midshipman during the later stages of the Seven Years War. When peace was made in 1763 he was discharged and had to seek other employment. Two years later he sailed for India to seek his fortune in the East. 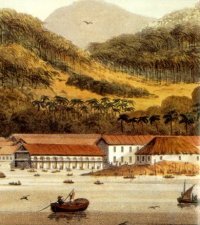 He does not seem to have had any promise of employment by the East India Company, and we next hear of him as the captain of a " country ship " owned by the Madras firm of Jourdain, Sulivan and de Souza engaged in the local commerce of the eastern seas. His employers were interested in opening up trade with Acheh, Kedah and southern Siam, and sent him to Malayan waters as an agent. He learnt to speak Siamese and Malay well, and became friendly with the Sultan of Kedah, Sultan Abdullah Mukarram Shah. This ruler was nominally the vassal of Siam, but at this time his overlord was busy with a long war with Burma, and he was much troubled by another power - the Bugis. They supported dissident forces in Kedah out to depose him and had captured Kota Kuala Kedah in 1771. Light re-captured the fort for the Sultan and used it as a base. In return, Light promised to use the fort to protect the Sultan from any attacks that might take place from the Kedah river estuary. It was probably this promise that led the Sultan to believe that the English would provide him with military aid against his enemies. In 1771 Francis Light reported this offer to his employers and strongly advised them to persuade the East India Company to accept it. He also wrote to Warren Hastings, who in the next year was appointed Governor of Bengal, suggesting that Penang would be a " convenient magazine for the Eastern Trade ". In 1772 two missions were sent, one to Acheh and one to Kedah - both of which were unsuccessful. Bitterly disappointed, Light withdrew to Phuket, where he carried on trade from this headquarters for the next fourteen years. Phuket was the resort of merchants of many nations - English, Portuguese, Bugis, Malay and Danish - who brought cotton piece goods, opium and dollars to exchange for the tin produced in the area. The chief disadvantage was the uncertainty of Siamese rule, which led to sudden attacks on the settlers and the extortion of high tolls by local governors. The war with the American colonies, and their allies France and Holland, highlighted the growing importance of a naval base and commercial settlement for Britain in the Straits - and gave Light the opportunity for which he had waited so long. In May 1786 he was made a Captain in the Company's Marine and Superintendent of the new settlement. Sailing with three ships carrying 100 sepoys, 30 lascars, 15 artillerymen and 5 British officers, he arrived off the coast of Kedah and presented his authority with the usual gifts from the Governor-General to the Sultan. But the answers which the Company gave to the points most important to Kedah were vague and evasive. In place of the general promise of protection the Company only undertook to keep an armed vessel to guard Penang and the adjacent coast belonging to Kedah, and there was no sum fixed for compensation for loss of trade. The Sultan, who had hoped for more definite answers, hesitated, but finally he agreed to sign. Light must have known that the Company was determined not to be mixed up with local wars but hoped that the Company would give the necessary support once the settlement was made. The expedition then sailed to Penang, and a landing was made on the point of the peninsula on which the town stands today. In 1786 this site was covered with thick jungle, and there was only a handful of Malays living on the island. The work of clearing the jungle proved arduous, and the sepoys complained of the hardships of the task. To stimulate them we are told that Light ingeniously fired a gun loaded with silver dollars into the forest. 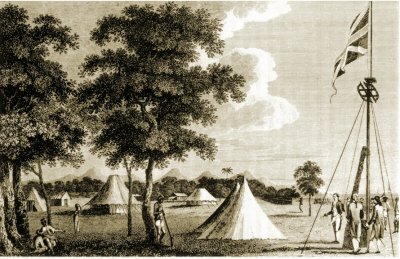 After four weeks enough ground had been cleared for the camp, and Light took the opportunity of the arrival of two East Indiamen to hold a formal ceremony to take possession of the island. The flag was raised on 11th August 1786 in the presence of the Captains and officers and saluted by the guns of the ships and volleys from the muskets of the troops. The name of Prince of Wales Island was given to the settlement, but this was soon forgotten. The new town was to be known as " Georgetown " in honour of King George III. The Siamese were soon threatening to attack Kedah and re-impose their suzerainity over Kedah. With the promised help from Britain now non-existent, the anxious Sultan tried to obtain the help of other European powers by offering Penang as a reward for their aid. In 1791 he attempted to expel the British from Penang, building forts in Prai, gathering a force estimated at eight to ten thousand men and securing the assistance of a fleet of Lanun pirates. Fortunately for Light, the Penang garrison was reinforced by two companies of infantry from Calcutta and, after failing to persuade the Sultan to disperse his forces, he took the offensive. Troops were landed at Prai and attacked and defeated the unprepared Malay forces gathering there. and the forts they had been constructing were burnt. 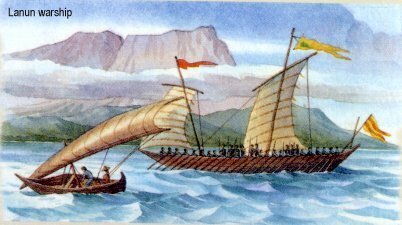 At the same time, gunboats attacked the Lanun ships and drove them away with considerable loss. The Sultan sued for peace. Though he had lost, he at least now has the unique distinction of being the first Malay ruler to resist British rule on the Peninsula. A second treaty was signed by which the Company agreed to pay him $6,ooo a year for the cession of Penang - and this time there was no mention of any protection or military aid. The East India Company must take the blame for allowing Light to mislead the Sultan with promises of a military alliance - Light was too much of a pragmatist to think that a small colony such as Penang would survive for very long without some form of military intervention at some point in time in the future. As Light had foreseen, the reluctance of the British to intervene militarily in the peninsula was to cause further friction and crisis in Kedah in coming decades. Under Light's successors Major Macdonald (Superintendent 1795-99), Sir George Leith (Lieutenant-Governor 1799-1804) and Mr. R. T. Farquhar (Lieutenant-Governor 1804-5), Penang continued to make steady progress in trade and population. In 18oo negotiations with the Sultan of Kedah resulted in the cession of the coastal strip opposite the island in return for the increase of the annual payment from $6,000 to $ 10,000. The newly acquired territory was named Province Wellesley after the then Governor-General in India. This greatly strengthened the security of the island and its shipping from pirate attack or possible invasion. As for Light himself, he had lived in the East for an unbroken period of nearly thirty years and had been for long suffering from malaria. He died in Penang on October 1794. The evidence of his letters and of his friends shows him to have been an attractive personality, persevering in the objects which he had at heart and a capable administrator who, despite great difficulties, gave Penang a good start on the road to a prosperity which he did not live to enjoy. His own words, written just before his death, may be taken as a fitting epitaph: "History shows no Examples of the first Adventurers making fortunes, it is sufficient that hereafter they are spoke of." William Light (right) was the son of Francis Light and founder of the city of Adelaide. There is no known portrait of Francis Light and his famous statue in Penang is based upon this portrait of his son.